One of the greatest joys my husband and I have had, is educating our children at home. At one time, we did not even know that this was an option. I believe there are many people just like us, who don’t know this is an option. The purpose of this page is to inform you about homeschooling and give you some references. Click here to see my blog articles on home education. I would suggest reading the book: The How and Why of Homeschooling by Ray E. Ballmann, published by Crossway Books, a division of Good News Publishers, 1300 Crescent Street, Wheaton, Illinois 60187. If your local book store does not have it in stock, they should be able to order it for you. It is available in paperback at a reasonable price. This is a wonderful book that explains homeschooling and then has lots of references. It even has a chapter for grandparents to read, explains why fathers should be involved in homeschooling, and gives pointers on how to get your friends and relatives to understand why you have decided to homeschool. Next, go to a meeting of your local homeschool organization. This way, you can talk to other homeschoolers. Through your local homeschool group, you can stay up to date on pending legislation that effects homeschool, attend loads of field trips and extra-curricular activities, and you and your children can make some great new friends. If you decide to homeschool, make sure you learn what the laws are regarding homeschooling in your state and abide by them. I strongly recommend joining a local homeschool organization and the Home School Legal Defense Association (HSLDA). You may be able to join HSLDA for a discount through your local homeschool organization. 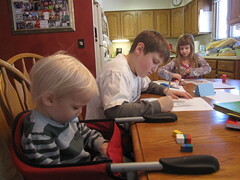 Homeschooling may seem frustrating and difficult at first, but stick with it. Once you get into a routine and realize that you can do it, homeschooling will become much easier. As long as you stay committed and focused, homeschooling will become one of the most rewarding things you’ve ever done for your children. Click here to find a homeschool group in your area. Is it legal? Yes, homeschooling is legal in all 50 states. Are parents qualified? Yes, you only need to be literate and committed to homeschooling. What about socialization? Children learn socialization by watching and mirroring. Do you want your child to model after you or after the 25 or so other children in his classroom? How much time does it take? Not near as much as you think. Think about all the time your child spends on the bus, walking from classroom to classroom, waiting for everyone in the class to settle down, in recess, standing in the lunch line, etc. All of these inefficiencies are done away with in homeschooling. You can easily achieve more in 3-4 hours a day than what is achieved in conventional schools. What are the biggest obstacles? Lack of confidence and/or a low level of commitment. It’s always heartening to find another homeschooling family, lori. My wife and I have been homeschooling our sons for the past two years (she does most of it, while I just take care of the English/writing). By all measures, they’ve done wonderfully, thus far. Glad you stopped by our place, and even more pleased to have found your blog, as well! Thank you for your visit. As you said, it’s always heartening to find another homeschooling family. Stick with it. It’s a tough job, but it’s the best one out there.